Revisiting an old favorite recipe of mine: Corn Poha,( pressed rice), a variation on the classic Batata Poha. I make this when I am limited on time, especially on weekends when there is so much on the go. Try this for a change! I saw Vidalia Onions in the supermarket the other day, and I just had to get them. I am sure many of you are familiar with this sweet onion that just pairs so well with such savory recipes. I decided to use them for Corn Poha....one of my favorites to make on weekends. Corn Poha with fresh lime juice squeezed on top and tea....isn't that what weekends are made for? Corn Poha are similar to the famous Batata-Poha, this just uses corn instead of potatoes....for variety, that's all! Add the Sweet Vidalias in this instead of the regular onions and You won't even need to add any sugar.....it's that good, and you all know how much I like my sugar! In a wide pan, heat some oil. Temper the oil with some mustard seeds, asafoetida and turmeric and the curry leaves. When the mustard seeds pop, add the chopped Jalapenos, and the peanuts or cashews. Let this sizzle. Now add the delicious Vidalia onions and the corn. Mix until the onions are translucent. While the onions and corn are cooking, place the poha in a drainer and run a little bit of cold water through it until it gets wet. Turn the water off right away, don't let them get soggy....separate the Pohas with your fingers. Add the Pohas to the onion-corn mixture and stir well. Add the salt and some lime juice on top. Serve with some Mint-Coriander chutney, yogurt, or the way I like it -with Garam Masala Chai. 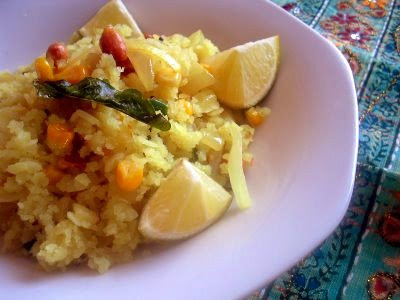 Here are some other versions of the Poha that I found on other blogs.....check those out too. Manasi of the blog"A cook at heart" makes wonderful Dadpe-Pohe....this one, I have tried and it is wonderful! Pooja of "My Creative Ideas" makes the Classic Batata-Poha.....a Gujju favorite. Mika of "The Green Jackfruit" makes Puli Aval - a South Indian take on Batata Poha using tamarind, urad and chana daals...a must try. We got some sweet Videlia from the farmer's market last Sat.,it's locally grown here in NC. T,check this site,they are linking all our posts without asking us. that is a nice recipe Trupti. So many colors in your blog. looks like Spring! there are so many other things to notice other then recipes.:). the spring fling is till May end right? may send one more entry. not decided. Looks so fresh light and delicious.I love your header banner, looks like spring on your blog. Nice dish. I have to try this, I have about 2 packets of Poha from long. Nice picture. Marathon me bhaag lidho lage che!!!!!!! You are on a blogging spree girl!!!!!! And what a lively one that too!!!! I have tried a handful now, including the simple tikhi puri and batata shak(hope got that right :)!) all AMAZING...And I know I will be trying out quite a few more of them!! i love this new tune, trupti. Hi Trupti, Really you are very creative. Nice recipe. Good Combination..thanks for sharing. I know what I am making for b'fast tomorrow - Poha! Niiiiiiiiiiiice! i like poha with variations! I like the onion variety too, lets see if i can get it here!! Looks very healthy and delicous Trupti. Poha is one of my kids' favourite breakfast and I make it often on weekend mornings. mane khabar chhe, tu banave etle kaik veriety to hoy j . :) . corn poha looks so healthy. i love sweet corns, will try it sometime for sure. i hope you are well now. so many dishes around here , i missed, will see all now one by one .:) . amba haldar pan ketli saras lage chhe. :D. after all apni traditional vastu j apne bhave, barobar ne ! 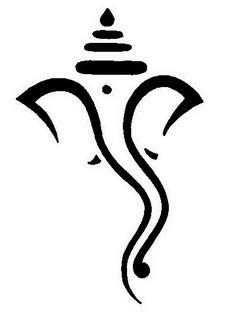 NJ 19th na aavu chhu, ticket fix thai gayi chhe :D. Hugs to you , and hope to see you soon sometime. Yummy looking Poha! Never made it with corn though! Looks delicious! As simple and homely as it can get! 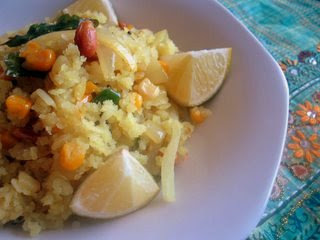 the picture looks awesome trupti, i love poha.Your blog is looking so nice very refreshing! Akele akele enjoying the yummo b'fast! Gimme some, now :-D.
very interesting, love the recipe. i have never made poha with corn, only with potatoes, carrots, peas etc, so have to try it with corn now! This is a beautiful blog and youve made some of my favorite things! I love poha and how simple it is to make..and your kadhi looks devine! I want to dig into it now! This sounds very fresh and flavorful :). I would love to include your recipe in our pre-loaded Demy, the first and only digital recipe reader. Please email sophiekiblogger@gmail.com if you're interested. Trupti, you have a beautiful blog! i love teh name & all the pics & teh header painting - did you paint that? nice stuff! I loved the poha picture. Looks so delicious. you know this is one of my fav item from your blog dear T. Kem chhe tu ? didnt know that u are alive on blog, as i was away fro mblogging since a while. nice to see those diwali posts. pics are great too. Happy diwali and Saal mubarak to you and your family. Trupti..all your Diwali posts are wonderful!..Hope you and your family had a great diwali! There is a sweet surprise for u on my blog....kindly collect it. I love Vidalias and I don't use any other onions except for the green ones. I love their sweet taste!